Open Every Day, Including Easter Sunday! First 3 hrs - $16. First 3 hrs - $18. Extra Hours - $4, $3, $2, $1 . . . Most mountain bikes, tandems, and road bikes start at $25 for first 3 hours. Click on "RENTAL BIKES" for photos, specs, and rates for different types of bikes. One bike for one week - $150. Second week - $125. Additional week(s) - $100. If renting two bikes for one week rate is $150 + $125. A third bike is $100. Clip-in pedals (spd) and shoes - $4. Car bike rack - $5 day. We have three Saris Bones strap-on racks. They hold up to 3 bikes. We have three hitch-mount bike racks. One holds 2 bikes. One holds 3 bikes. One holds four bikes. Rates include free lock, helmet, map, panniers, repair kit. Repair kit contains pump, tube, tire irons, patches, master link, chain breaker, Allen wrenches or an all purpose tool. 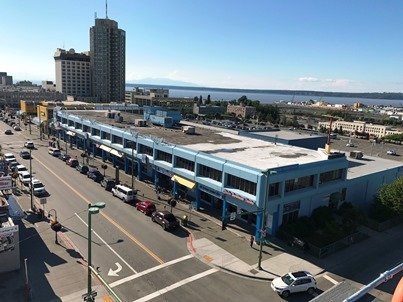 There is no sales tax in Anchorage. Northbound rider about 4 miles from downtown. All 11 miles of the trail were recently re-paved. We have more than 200 bikes so reservations are rarely needed. See FAQ 1. When you get here test as many bikes as you like before making your choice. After bike is selected we discuss where to go and how to get there. No guide or tour is needed to ride/enjoy nearby trails. Southbound rider. The trail faces west so summer's long twilight makes evening a great time to ride. 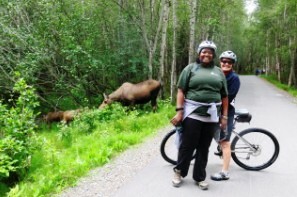 "If you don't spend at least a couple of hours on a bicycle during a stop in Anchorage, you're missing out on what could be the highlight of your vacation." - 2008 Anchorage Daily News Visitor's Guide. There are four paved greenbelt trails that ring the city. The 11-mile Tony Knowles Coastal Trail is the best. Together with the Chester Creek Trail, the meandering Campbell Creek Trail and the new Ship Creek Trail, they create a bike beltway. 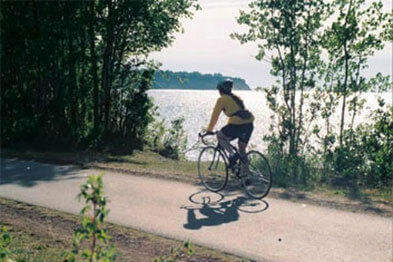 At the southern end of the Coastal Trail is Kincaid Park and 25 miles of singletrack mountain bike trails. Click here for a map. Click here for a video. Near mile 7 on Coastal Trail. Open 8 a.m. Close 10 p.m.
Open 8:30 a.m. Close 9:30 p.m. Check here for updates as daylight decreases. 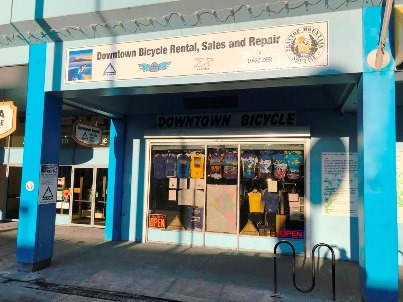 Rentals and returns outside of these hours available upon request.